The Great GI JOE-Transformers War took place in 1988, and resulted in the Autobots/Joe Alliance (AJA) gaining control over the Union of Decepticon and Cobra Forces' (UDCF) strongholds in the Bedroom and Backyard theaters. For years, people argued over which was better: GI JOE or Transformers. 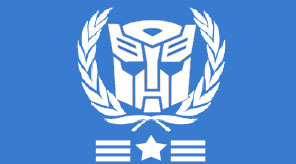 Meanwhile divisions existed in each of these factions, between the Autobots and the Decepticons of Transformers, and the Joes and Cobra of GI Joe. Cobra had gained control of large sections of the Backyard, including the area from the Big Stump to the Flower Bed. Meanwhile, Joe forces had dug in near the Back Door, and had set up air fields by the Clothesline. Simultaneously, both forces had gained significant territory in the Bedroom, with Joe well established on the Dresser, and Cobra forces maintaining terrorist cells deep Under the Bed. At the same time, Autobots and Decepticons were building their own forces in both the Backyard and the Bedroom. The Autobots had taken the Toybox and controlled the Back Walkway, while the Decepticons had set up in the Closet and the Back Fence. "Megatron! Let's desssstroy those pathetic Joessss and Autobotssss!!" With those words, The Great GI Joe-Transformers war had begun. Quickly, Megatron accepted, and the UDCF came into being. In the Bedroom, the AJA used their high-ground advantage to its fullest, sending both Skystriker and Conquest aircraft, followed by the Aerialbots. However, this move was merely warm up, the main attack followed by a ground assault by the Dinobots and Roadblock to quickly knock out the UDCF in the Closet. Their attention then turned to the deeply dug-in forces Under the Bed. The AJA did not notice that the battle for the Closet was much too easy. Megatron had moved most of his forces into the sheltered Under the Bed area to reduce the AJA's ability to strike from the air. Immediately Starscream and Skywarp launched alongside Cobra Rattlers and quickly took out the AJA's air combat ability, taking down Fireflight and three of the Skystriker aircraft, thus gaining air superiority. Ironhide and Bumblebee, along with Gung Ho and Shipwreck in Vamps, led a ground assault on the caves, and punched a hole in the UDCF's seemingly impenetrable defense. Starscream and Skywarp immediately fled to the Backyard theater, seeing that the day was lost in the Bedroom. The worst of the fighting came from the Battle for the Backyard. Heavy losses were incurred on both sides in this terrible conflict. 4 Joe, 5 Cobra, 2 Autobot, and 4 Decepticon figures were missing and presumed lost, as well as countless broken thumbs and disjointed legs on both sides. Duke jumped in to Optimus Prime's cab, and led the AJA charge against the UDCF forces. Cobra Commander wielded Megatron and joined the fray. Decepticon forces dropped Firecrackers on to AJA, severely wounding QuickKick. Snake Eyes and Stormshadow battled atop the Big Stump, with Stormshadow eventually being pushed off the side before being caught and carried off by Starscream. At the end of the intense fighting, the AJA had won the day, forcing most UDCF troops into the prison of the Toybox. Starscream and Stormshadow returned much later to free them, but that's another story. Later photos were discovered of Shipwreck (presumed KIA) showing horrendous torture in captivity by Cobra operatives, including the infamous lighter technique resulting in loss of limb. Clearly it was a strategic stronghold, and having a bedroom with track lighting, shag carpeting and three electrical outlets was a bonus. 2/19 Autobots land on Barbie’s Playhouse at 8:59A.M.. This comes after 10 weeks of bombing from Joe's planes and plastic missiles. The preliminary bombardment had been the heaviest up to that point in the war. A total of 7 GI Joe's, 2 micro machine tanks, 4 Star Wars figurines including a limited edition Darth Vader (who was good guy now), 6 plastic army men, 3 expensive transformers, 4 Tinkertoy ships, 3 constructs ships were available for the invasion. Bumblebee scouted out the terrain, only to be attacked by the Combaticons and a Cobra force, and taken hostage. Scarlett and Joe led the charge towards the playhouse, flanked by Prime, Hound, some Lego people, Cliffjumper, and many other GI Joe figurines. However, the UDCF were not without defenses. Dr. Biggles-Jones coordinated the seemingly impenetrable defense of the area. With Cobra snipers mounted on the roof of the playhouse and multiple foot soldiers, the area seemed hopeless to the AJA. Prime led a Autobot strike team (consisting of Tracks, Cliffjumper, Sunstreaker, and Ironhide) to do battle with Soundwave and his components, while Rodimus Prime, Blurr, Springer, Kup, Blaster, and the Dinobots faced off against the Constructicons. Ratchet and the Joe's medic provided medical support. Joe and Scarlett led soldiers into the front door of the playhouse, seizing command of the dining room and front hallway. Before long, the fighting had reached an unprecedented level. Springer and Blurr were annihilated by Devastator, while Dr. Biggles Jones had been assassinated by Nightbeat. Fortunately, Ratchet was on hand to save the lives of Sludge and Cliffjumper. In a desperate attempt to keep a foothold on the area, the UDCF dispatched Skywarp and Thundercracker on a bombing raid, laying waste to the area. After two hours of attack, the playhouse lay in ruin. Thousands of shards of plastic. The soldiers knew then that they had gotten carried away. Barbie was also carried away, and held hostage for the remainder of the war. The Bathtub was a key held area by the AJA to keep Naval superiority. In a daring air strike by the Joes and Skyfire, they were able to toss multiple and some Autobots Joes onto the prime fleet. Out of the seven Joes that were tossed onto the ships, four actually landed on something dry: Beach Head, Scarlett, Dusty, and that ninja woman with the red band over her eyes. The three that landed in the water drowned and they were given a simple funeral. The four that survived went on to sabotage the aircraft staying at the ready and then blew holes in many key sections of the ship, but not without heavy resistance. Meanwhile, Seaspray attempted to head off the oncoming Tidal Wave, sacrificing his life for the AJA cause. A quick shot from an AJA sniper who was warming up for the later invasion fired a small projectile that caused one of the Joe's to topple off the ship. Eventually the charges that were placed in the bottom of the ship caused it to sink. One brave Joe equipped with state-of-the-art Action Navy Seal Diving Gear was sent on a secret mission to remove the plug from the bathtub drain, but was tragically eaten by a rubber squeaky shark. All knowledge of this incident was disavowed in the years following the war. This was one of the most daring strikes in the war, and ultimately affected the outcome of the Battle Of The Front Hallway. After their crushing defeat in the Bathtub, the UDCF retreated south toward the Front Hallway, stopping in the Living Room to refuel, regroup, and radio for backup. Soundwave stood guard while the others recuperated, dispatching Ravage and Laserbeak to reconnoiter the area. Meanwhile, the AJA was in hot pursuit, sending Bumblebee and a squad of Joes ahead, where they ran afoul of the Decepticon Mini-Cassettes. They returned to the Living Room and alerted their master to the incoming AJA force. They proceeded to send a smaller contingent to take up defensive positions on and along the couch, so as to cover their evacuation. Lead by Storm Shadow and Starscream, the defenders hatched a daring plan to topple the giant couch cushions onto the incoming AJA convoy, crippling them long enough for the evac transports to reach the front door. In the days following the war, people began to realize that while GI Joe was a Real American Hero, with their alliance with the Transformers, they became more than meets the eye. The AJA and the UDCF would wage several more wars on each other, up until the rise to power of the Teenage Mutant Ninja Turtles. Though it is reported Spur attic fighting is still being waged in "Geeky People's heads" where Casualties are said to Include Cobra Commander III, Ultra Jesus and three members of Kraftwerk. This page was last edited on 23 October 2014, at 03:55.